I like to dress with a level 1 combined with level 2 level of refinement, but don’t want to look try hard or overdressed when not dressing for more formal or fancy occasions. What to wear? If you are a more formal dresser naturally, you prefer more classic or structured clothes, finer fabrics and an overall higher level of refinement, then dressing up is easier for you when you’re going to more formal occasions, but everyday dressing can be harder as you may feel overdressed compared to others who have a much more relaxed and casual dressing style. Always consider the fabrics you’re choosing. Even for a smarter or fancier event if you don’t want to look overdressed steer away from shiny fabrics. Or if you want to glitter, just make it in smaller doses such as an accessory or one smaller garment. 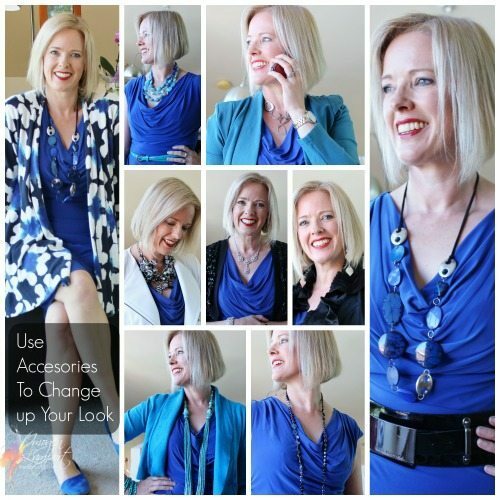 You can dress a cocktail dress down with a less formal necklace or cardigan or jacket. Changing your shoes will also change the way the whole outfit appears. 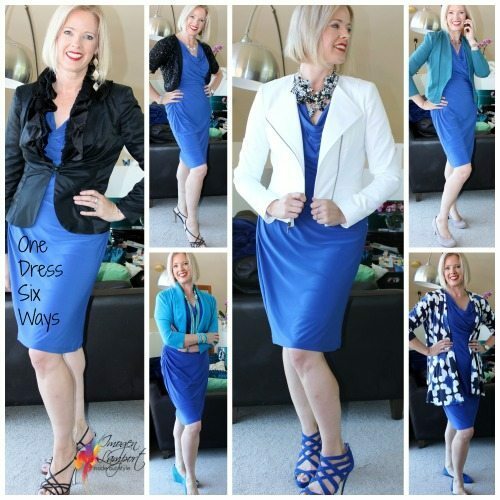 Here I’ve taken one dress and styled it 6 ways, so you could wear it to a cocktail/formal event, dressy dinner or event, date night, lunch with the girls, to work, and smart casual. You can see that the accessories make a huge difference, as does the 3rd piece, as to how formal the outfit becomes. If it’s a smart but not overly formal event, why not mix a little denim with something more sparkly or shiny to dress it up. It’s also important to own your personal style, and even if that’s a more formal one than your contemporaries, that’s ok, if you are comfortable and confident in your clothes, people will get used to how you dress quickly, and may even start dressing a little more smartly themselves! 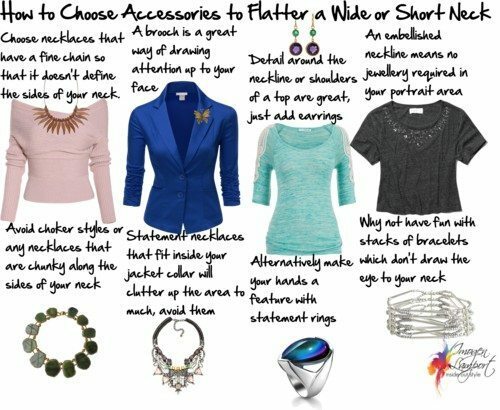 You have a great way with accessories. You are so right in how they have the ability to change a look and finish an outfit. By the way, it did take me a while but I really love the blond hair on you – and blue is definitely your color! Tri-coloured jacket looks fabulous on you. A bit off topic, but I just wanted to say that I like the way you emphasise personality in “training” people how to dress. 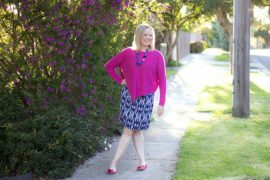 Like many of your other readers, I’m sure, I look at various sites around the web and some of the dressing seems to get quite formulaic, especially when style-types are involved. I’m sure they’re useful, not knocking them necessarily, but, it can all get a bit costume-like, as if the person being styled is being styled for their walk-on on Dynasty. Keepin’ it real, Imogen, keepin’ it real! Your information is so useful. Thanks Kate. I hate strict formulas and boxing people up into a limited set of parameters. This question could have been asked by me! (It wasn’t) Amazing what a difference shoes can make! Personally, I prefer to adjust the formality by changing the color palette of the outfit (or choosing a different fabric on the pieces), because ive noticed ive a shoppping habit related to it. I cant forget the time where i discovered why i never wore a certain item pieces was because i wasnt comfortable with the color combination! About two years ago, i bought a deep red ruffled blouse that i wanted to my wear with my dark jersey/knit pencil skirts and flats but refused to wear it because my brain keep telling me it was too dressy which is strange because i wear sleeveless collar shirts with pencil skirts with fineknit sweaters all the time. I ended up throwing that blouse but later, i bought a new ruffled top but this time, it was olive and paired it with a khaki twill pencil skirt and had no problem wearing it! Changing accessories or shoes doesnt work for me, because i can only wear high vamp shoes for longer time periods (“delicate” flats hurt my back the same way heels does!) so dressing down/up an outfit by switched shoes isnt a good option for me. i have always thought lighter and more earthy colorcombinations (or block of colors) looks more casual than the deeper/darker ones even if the pieces are exactly the same. To people who are devoted to specific colors (seasonal or properties) Im sure this wouldnt work but it still baffles me why I didnt realize my dressing “problem” several years ago. The sparkly bolero is the most dressed up, then followed by the shiny black jacket, then the white jacket to the green jacket down to the short blue cardigan and most dressed down is the patterned cardigan. Ah thanks! Looking at other people’s outfits do help a little when trying to understand dresscodes or what-to-wear-to-what occasion. :3 I think my go-to dressyness is very similare to the 2nd less dressy outfit you showed (but a diiferent style), the one with the short jacket. Many smart casual day looks ive seen are little too relaxed for my taste because i dont like denim or the more relaxed cardigans but im not quiet a suit (seperate) person either! :s i tends to wear dresspants or woven pencil skirts with very fine knit short cardigan or sweaters, but with more relaxed footwear, like riding boots in a smooth leather or glossy 1″ wedge-ish low heeled pumps and occasionally, oxfords. I dont follow the dresscodes “strictly”, but they help me finding a guideline on how dressed up i prefer to dress on daily basics. Is a office skirts/trousers with fine knit sweaters and sleeveless blouses worn with flats/tall boots, smart casual or is it dressier (in general)? Because i always seems to mix up smart and work outfits. Huh. I would have put the shiny, ruffled black jacket outfit as the dressiest, followed by the white jacket. The bolero sweater would probably be third, as far as what looks the dressiest to me. The bolero is sequinned! When you see it up close you could tell more easily. Oh, I see. That would make it dressier! 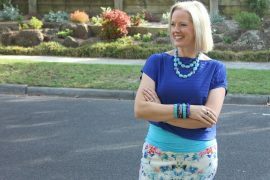 Funny thing Imogen, not knowing the fabrics, I would switch around the blue cardigan with the patterned cardigan. 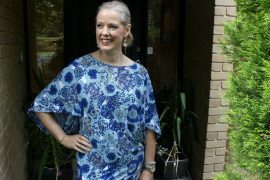 I was a private cleaner for two and a half decades, now that I am retired I found I was slipping into my ‘cleaning uniform’ too easily when I stay home for the day. I was pretending I will get busy cleaning but didn’t actually get around to the moping or dusting or real cleaning. Your site reminds me how important it is to look nice for my husband, and drop-in guests but most of all for me. I have a classic natural style and I enjoy reading your blog because it stops me from relaxing back into bogan casual too much. I now have a ‘work’ uniform and a ‘dressier’ uniform for the days I stay home which incorporates the recommendations of your article. One pair of pants with attractive but no-nonsence ‘work’ tops to clean and ‘dress’ tops with some casual jewellery if I am just pottering around so I am prepared for unexpected guests or a trip to the corner store. Of course, I do have ‘yard’ clothes for the dirty work. I love this dress Imogen! It does look fab on you …. And I absolutely LOVE it all your accessories. But I have recently felt the need to start changing my style a little. It’s mainly because I feel structured clothes do make you look more mature and sensible, and there are times I just want to create a look that’s young and playful. These tips really really help! Thank you so much! I do collect ALOT of neck pieces and scarves myself. I think when you’re on the other side of a DD cup, you kind of have to! Thanks Maneera. 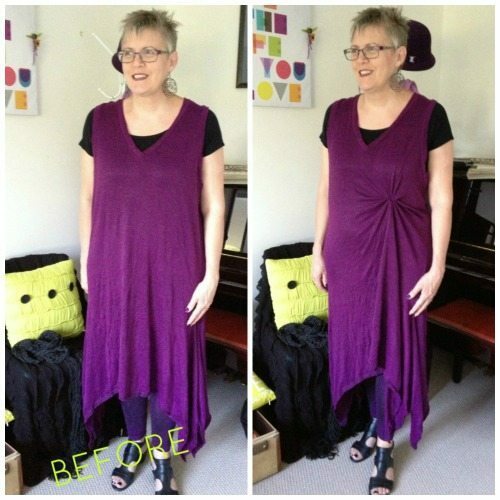 Yes structured clothes are great – but you don’t want to wear them all the time – finding clothes that have some structure but softer fabrics is a great way of blending the two elements to get the affect you’re after. I did try your advice and it’s worked WONDERS for me. I got a ton of compliments all weekend – especially from the hubby, coz I managed to take only 10 mins to put together polished, classy yet relaxed outfits!!! Imogen I love all the ideas here. I crave the ruffle jacket although I ma be too short for it. I wonder if it is still available. Could you give me some info on it? I can’t hardly wait to find out my colors. this jacket is years old from an Australian brand Boo Radley – a ruffle is OK for petites if it’s not too large, just something small will give the feel but not overwhelm your frame.